A composable architecture is an integral part of a cloud based or cloud native platform like Mambu. It is a modular software design methodology consisting of small, self-contained and easily- interchangeable building blocks. An orchestration layer directs all interactions between components, providing flexibility and seamless integration with other services. This setup allows Mambu to scale, adapt, and innovate much faster than traditional monoliths. You can see the list of all our technology partners in the Mambu Marketplace. This part of the documentation specifically concerns the Mambu Connectors which have an existing integration with Mambu. 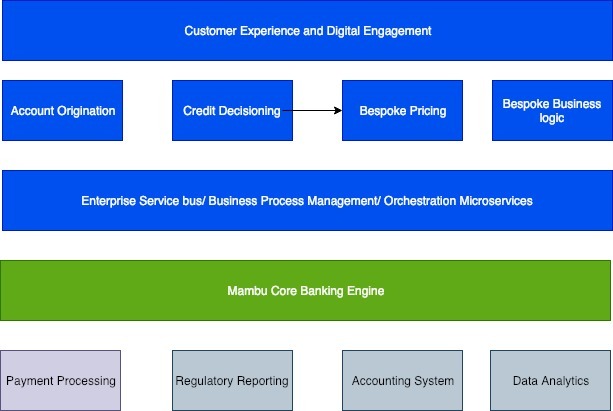 Mambu brings together technology vendors that can enable financial institutions to build a composable architecture, with its core being the Mambu SaaS banking platform. These integrations are built and maintained by the Mambu team. These integrations are built and maintained by the concerned technology partner. These integrations are co-built by Mambu and a technology partner. They are also maintained jointly.